How to find files faster with Everything! Today, we are going to learn about a very useful App to replace the default Windows Search, known as Everything. Everything is a freeware app made for Windows Operating System by David Carpenter. Everything is an offline search engine that locates files & folders by filename instantly. It’s kinda better and faster alternative to default Windows Search. Whenever a user runs Everything, it creates an index of names of every file & folder residing on the Hard Disk in a matter of seconds. Once indexed, it continues to update its index in real-time with minimal resources, which is usually about 40 MB of RAM. Because Everything doesn’t index file contents and relies upon NTFS Change Journal it is unable to find and index files on any File System Volume, that is it may not be able to index all types of secondary storage devices. But you can try it to index any attached memory by Tools > Options > Indexes > NTFS > Auto include new removable volumes. Get a tick in “Auto include new removable volumes” option. How long will it take in indexing? It usually takes less than 0.00001 seconds to index a file regardless of its size. Most PCs have no more than 0.2 million files. So even if you have a million files, it would take less than 10 seconds that too on the first run. Somehow, it keeps getting better in terms of speed with usage, Or maybe it is only me feeling it 🙂 . How much resources will it need to function properly? A fresh install or run of Everything will use about 6MB RAM and less than 3MB of disk space. Sooooo even if you have a million files, it will require only about 50MB of RAM and 15MB of disk space. Though you don’t need to worry about RAM, it is not continuously using your system resources in the background, and only when you are really using it. Will it index file changes in real-time? Yes, it updates its index of files in real-time, your search window will reflect any such changes. Will Everything not index changes if it isn’t running in the background? No, it doesn’t need to be kept running in the background, Everything updates its index whenever it is run. Is Everything free to use? Everything is a Freeware and is absolutely free to use. You can consider donating. By the way, you can do consider donating to TechGlobule too, contact us to be a patron. 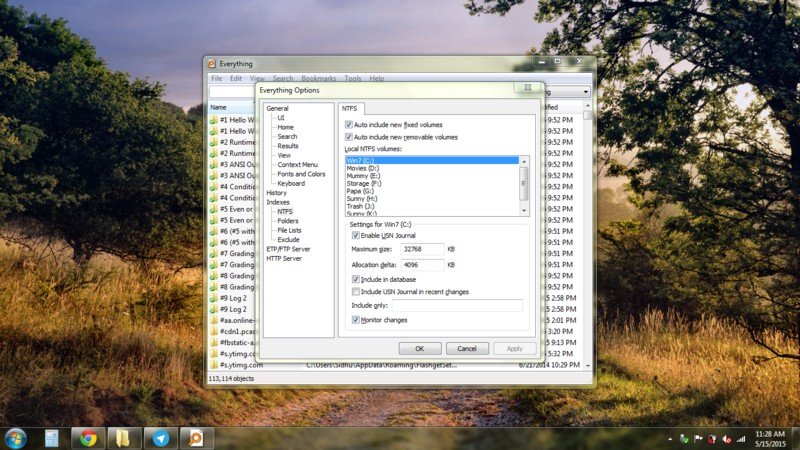 Unlike Windows Search, “Everything” initially displays every file and folder on the device, and then limits the results as we type the file name we want to search or get. Everything is way faster and uses minimal resources as compared to Windows search. I personally use it on my ASUS K50C Laptop with 2GB of RAM, and Everything was about 5 to 7 times faster than the traditional Windows Search. You can download your preferred version of your choice by visiting voidtools.com. (30 March 2018) – If not sure, you can download the as on date latest English version of Everything 1.4.1.895 for 32 bit Windows PC or Laptop by clicking here. It’s about half an MB to download. What version of Everything should I download? Installer The installer version will guide the user through the installation of Everything (recommended). The installed Everything.exe is the same as the portable Everything.exe. Portable The user must extract the Everything.exe to the desired location from the .zip file. No changes to the system are made. Most of the options in the installer version are available in the portable version too. x86 Only x86 context menu extensions will work in Everything. It will work better with 2GB RAM and low, that is 32Bit PC devices. But it can be used with 64Bit Devices too. x64 The x64 version requires a 64bit x64 OS. Supports databases larger than 2GB. Only x64 context menu extensions will work in Everything. The x64 version will use more memory than the x86 version. For sake of understanding, it will work better with above 2GB RAM or simply 64Bit Devices. English (US) Only English is available for this version. Multilingual Includes the Everything language pack for multiple language support. Image source – My ASUS K50C and inquirendum.nl for the featured image. Thats a LOT of info on this seemingly small footprint application. But nicely written. Good calculations. Been using Everything for years now. Thanx Vyom. I tried to explain every “if and but” of this seemingly small but essential app.